I enjoy making up fun little gifts to leave on the bed when we have overnight guests. This is a set of monogram cards I made for my nephew's girlfriend staying with us Easter week-end. I had a lot of fun using three sets of Guidelines stamps from Papertrey Ink to create the pretty designs on the bottom half of each card. Each card features a strip of monarch butterfly trim on the inside and envelopes stamped to match the cards. what a lovely idea of yours to leave as a gift for guests. I love all of the cards you have made especially the teal which fits my spin the Wheel challenge perfectly. Hugs Mrs A.
WOW what a beautiful set! Thanks so much for joining in the fun at our Double D ‘Just Wing It’ challenge! Good Luck and we hope you’ll come back often. I've always loved monograms & these are so pretty, Esther! What a thoughtful gift! I saw these in the thumbnail at Double D and they stood right out to me. They're so perky and pretty and I love them! Nice gift! Thank you so much for sharing with us at Double D! What a great idea and super cute cards. I know your house guest loved them. 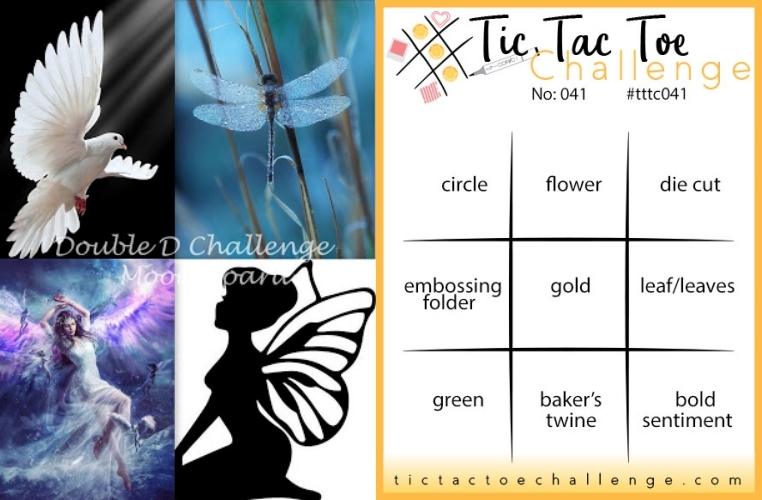 Thank you so much for joining us over at Tic Tac Toe challenge this week.